Jack Williamson has been in the forefront of science fiction since his first published story in 1928. 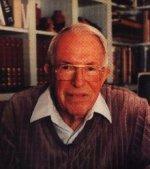 Williamson is the acclaimed author of such trailblazing science fiction as The Humanoids and The Legion of Time. The Oxford English Dictionary credits Williamson with inventing the terms "genetic engineering" (in Dragon's Island) and "terraforming" (in Seetee Ship). His seminal novel Darker Than You Think was a landmark speculation on the nature of shape-changing. Jack Williamson died Friday 10th November at his home in Portales, New Mexico. "The Heechee are one of the greatest creations of science fiction." "Good fantasy - and that includes science fiction - takes off from the known for its flights into the new. Cliff Simak was a master of the art. His known was the rural Midwest that he loved. His new could reach to the ends of space and time, but never beyond reality. Even his cosmic aliens always had half human dimensions that made them believable. I loved him, as so many did, for his unfailing warmth and a wit that was keen but never cruel. I heard from him often during the painful time after his wife's death. His own death touched me deeply, and I'm happy to see him remembered with this collection of his best-loved stories." "This is a book for today. Written honestly and plainly, it llluminates a universal problem."